The tree roots in these photographs came from a study by colleagues who dug up ponderosa pine trees with the aid of dynamite and a backhoe to figure out how much carbon and nutrients are stored underground. When the study was finished, the roots were set aside. 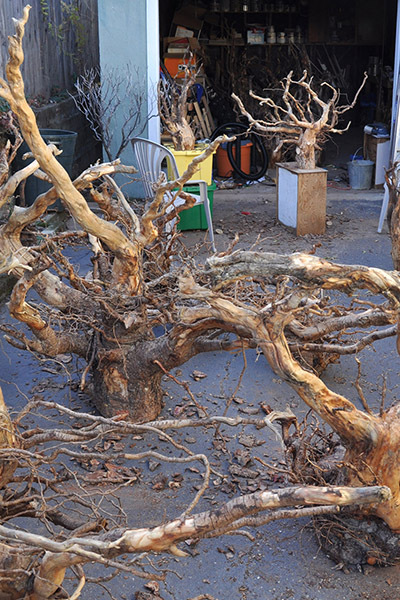 After years of walking past this pile of discarded wood and admiring the surreal sculpture-like shapes, I eventually rescued them, filling my garage and yard. As I began to scrape bark off and expose the beauty of the wood, the roots became more than just fascinating objects. I was at a cross roads in life, feeling disconnected from my community, and also processing the death of a friend in a climbing accident, which led me to think about parallels between the paths of roots and our own journeys. Roots are like the tentacles of life. The older we get and more varied our experience, the longer the tentacles. Roots continually branch out, exploring new patches of earth to find sustenance. Sometimes a root will hit a barrier and head in a completely different direction. Roots may diverge, never touching again. Others come back together, fusing or forming cross bonds. When a tree is alive, we have no idea where the roots all go. It is only when the tree dies and we dig it up that the story is revealed. The memorial celebration for my friend unmasked a world of connections among people who had, in a sense, followed the various roots of his remarkable life back to the base of the tree. It struck me that a complete picture of all the experiences that shape a person and enrich the greater community may not be fully apparent until death, when family and all those who have been touched along the way come together. With these photographs I am hoping to not only share the beauty and mystery of what lies underground, but also foster a contemplation of our connection to place, friends, and family - our roots. This project would not have been possible without the help of Carol Shestak, Neil Flagg, and Stacey Weller, who shared the creative vision and helped with logistics. Numerous others pitched in or inspired us, making the project more meaningful and fun than any of us could have imagined. Photo shoot locations: Surprise Valley, near Cedarville, California; Moonstone Beach, north of Arcata, California; Masonic cemetery and Union cemetery, Shasta, California; Black Rock Desert, Nevada. © Eric Knapp. All rights reserved.